The utilitarian bike movement is gaining serious steam. 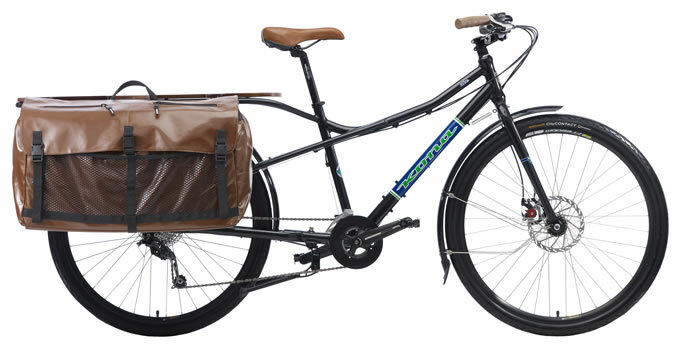 Whether you're an architect, handyman or delivery person, the Kona Ute makes carrying stuff on your bike a breeze. This year we've added two newly designed panniers made of waterproof vinyl, with a stiff plastic bottom for structural stability. The Ute comes with a 7-inch front brake rotor for stronger braking power, our comfortable Hand Plant handlebar and a newly designed alloy fork. We've also made the Ute compatible with an Xtracycle Pee Pod LT childseat, cause kids can be cargo too.